Our club offers skating programs for children, youth and adults of all levels. We are proud to be a member club of Skate Canada, the oldest and largest figure skating organization in the world, and the governing body for figure skating in Canada. 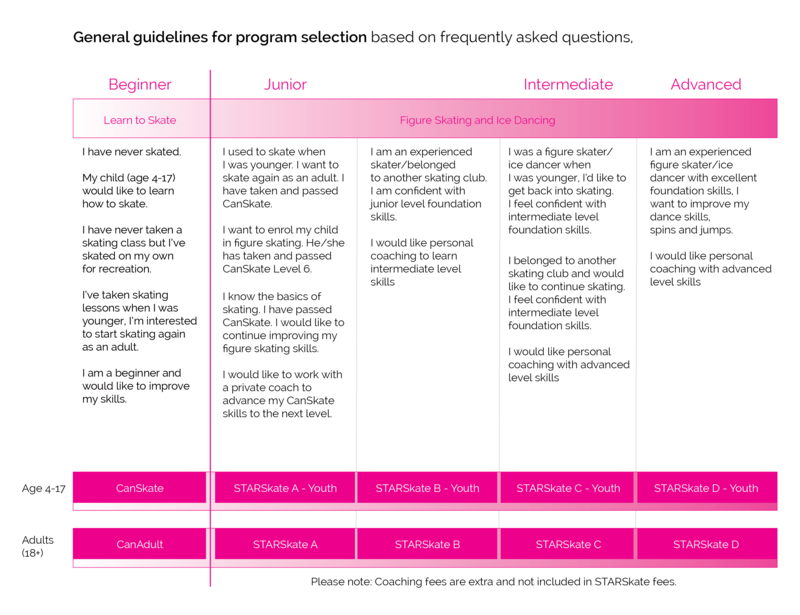 The skating programs are developed by Skate Canada and taught by professional coaches certified through the National Coaching Certification Program (NCCP). Learn to Skate | Figure Skating & Dance Programs | What Level Am I? Based on Sport Canada’s long term athlete development (LTAD) principles, CanSkate allows skaters to develop a complete series of balance, control and agility skills that will prepare them for recreational skating or ice skating sports. The program focuses on the development of skills organized into six stages of learning. Lessons are provided in a group format but allow each skater to progress at their own pace. Once the skills of one stage are mastered, a badge is awarded. It is common for beginner skaters to continue with CanSkate enrolment for multiple seasons to progress through each of the six stages. Olympic figure skaters, speed skaters, hockey players and NHL players learned to skate with CANSkate including Patrick Chan, Matt Duchene, Tessa Virtue and Scott Moir to name a few. The CanSkate learn-to-skate program teaches kids the fundamentals of skating and is a great foundation for pleasure skating, figure skating or hockey. CanSkate participants are between the ages of 4-17 years old. Children must be 4 years old by December 31st; Skaters who appear to be under the age of 6 will be asked for proof of age. A CSA approved helmet is mandatory. Face masks and wrist guards are recommended. CanAdult follows the same learn-to-skate program as CanSkate but is exclusively for adults (18+). Group instruction is provided by a certified coach and supervision from program assistants (experienced adult skaters). CanAdult takes place at the same time as the CanSkate sessions. The scheduled programming allows parents the opportunity to learn to skate at the same time as their children. All CanSkate and CanAdult skaters must adhere to the Skate Canada Helmet Policy. Central Toronto Skating Club provides group lessons, private coaching and practice time for skaters pursuing figure skating and ice dancing from Preliminary to Gold/Diamond level. The STARSkate program develops fundamental figure skating skills in the areas of ice dance, skating skills, free skate and interpretive skating. Skaters also have the option to take Skate Canada tests, a nationally standardized testing system. We have one of the largest adult memberships in Canada. Many of the adults in our advanced STARSkate program were child figure skaters and are now out on our ice as adults for fitness and fun: keeping their Axel in shape, mastering combo spins and learning ice dances. Some of our adult skaters even compete in Adult Nationals. 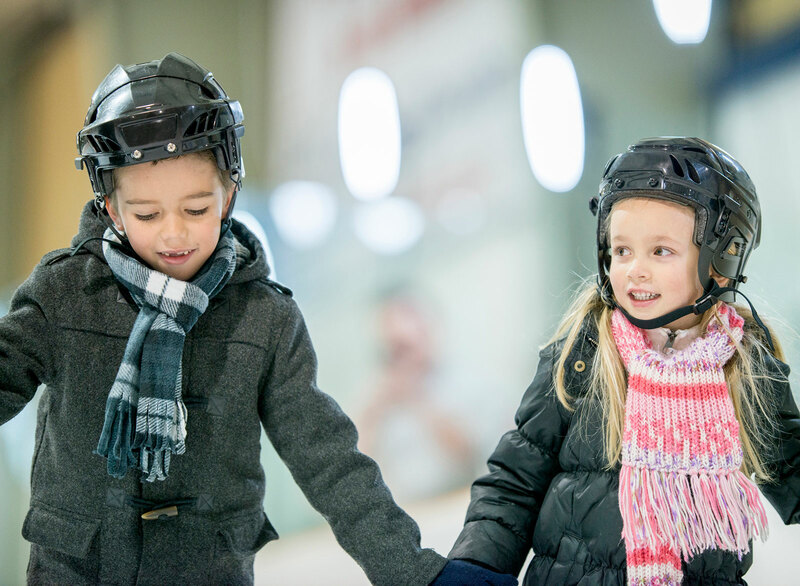 If you are not sure which session would be best for you or your child, the Skating Director will advise you (please email info@centraltorontoskating.com). Guest skates are available for STARSkaters only (no CanSkate/CanAdult). If you do not have a current Skate Canada membership, you will be required to pay the Skate Canada fee in addition to the Guest Fee. If you end up registering for the session you’ve been guest skating on, you guest fees will be deducted from your registration fee. Once the CanSkate/CanAdult levels 1-6 have been completed a skater is qualified to skate on the the StarSkate A session. Though group lessons are provided at this level, we encourage the skater to connect with a private coach. Private coaching is an important part of developing skating skills in skating. The private coach teaches and guides a skater through the many progressions of skating while addressing his or her individual goals and challenges. A typical starting point would be a 15-minute lesson once or twice a week. Cost for coaching ranges between $10 to $18 per 15-minute lesson, depending on the qualifications of the coach. Our list of coaches can be found here. Unsure what program you should register in? Below are general guidelines for your convenience. Our skating director monitors the progress of all our participants. If you register in a program that is either too junior or advanced for your skill set, you will be recommended for a more appropriate class* during the season.